Get Results with Direct Mail! It’s reaching customers — Dealerships cannot reach all of their prospective customers via email. Estimates are that only 50% of customers can be accessed by email. If you add social media such as Facebook and Instagram that number rises somewhat, but you need direct mail to reach them all. Direct mail works — Mail is targetable to different zip codes, neighborhoods, or income levels. Most mail recipients take the time to sort through and look at the mail they receive daily. A large percentage of prospective customers say they pay more attention to physical mail than emails or social channels. 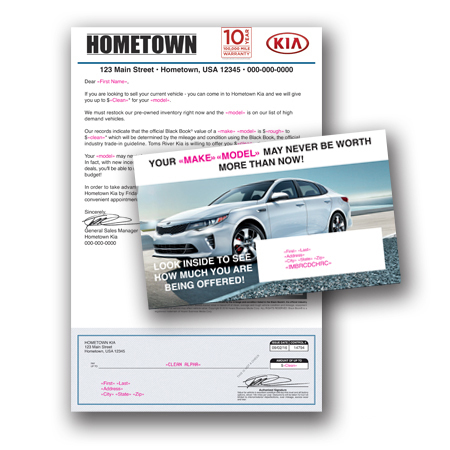 Direct mail complements social media — Some critics of direct mail state that younger car buyers never look at mail but depend on electronic communications. Although it is true that younger buyers use email and social media to a greater extent than older buyers, you won’t reach all of your prospects without a direct mail component in your marketing plan. It simply means that you don’t want to depend only on social media or direct mail to reach customers … use them all. Annual sales events tied to holiday shoppers, either tied to winter holidays or summer travel season. — These are campaigns designed more by local demand rather than manufacturer programs. For all the above reasons, direct mail from Premium Productions should be an integral part of your dealership marketing. Contact us today at 800-297-1990 for a consultation about how to best use direct mail to grow your dealership.